MANILA, Philippines – A Facebook post about netizen’s rant after he was offered a job vacancy in a call center went viral recently. 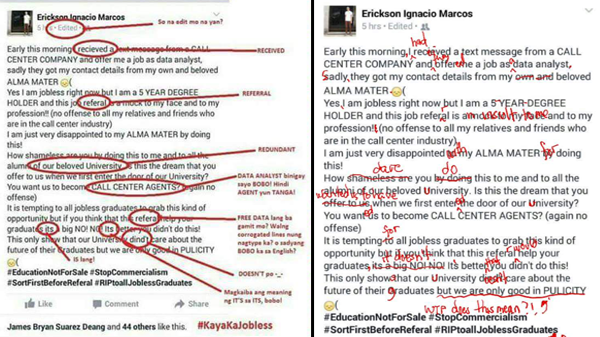 In a photo post by Vixenn Towana, two screen-grabbed pictures on an apparent rant by Facebook user Erickson Ignacio Marcos on his disappointment by a text message he got offering him employment as a data analyst in a call center agency. Marcos claimed that he was reached by the agency through his contact details given by his Alma Mater. Towana’s post is not just about Marcos’ rant but it’s mainly about the grammar corrections made—according to her—by a call center agent whom clearly know more on proper grammar and spelling than of Marcos. The corrections were inked in red, rephrasing and putting proper sentence construction on Marcos’ rant. Marcos in the post, narrated that his joblessness and the offer in a call center agency is mocking his profession and him as 5-year degree holder. He questions if the said University’s goal to their students is to let them be call center agents in the end. In the end of his post Marcos stated that offering these kind of jobs to unemployed university graduates is tempting. But he thinks this kind of referral is a big no. Marcos warns to not accept any job offers on that field. He concluded that his Alma Mater doesn’t care on the future of their graduates. Marcos kept adding a “No offense” phrase as he rants, trying to not offend anyone working in the Business Process Outsourcing (BPO) companies. Even though the Facebook post was shared a year ago, it resurfaced in social media gaining mixed reactions from netizens. The viral post garnered 13,000 plus likes and 8,000 plus shares with different views from the netizens as of press time. Towana, whom posted the photos has narrated to The Summit Express that he’s not the person who corrected Marcos’ post. He also wondered why the post went viral again after a year.